EW.com has added the latest Catching Fire still of Katniss and Caesar Flickerman (and all the Tributes) to their online image gallery as part of a slideshow of upcoming hot movie panels at San Diego Comic-Con. High resolution picture of Effie Trinket and Peeta Mellark at President Snow’s Tribute Party in The Hunger Games: Catching Fire. We were promised a surprise today by Lionsgate and they have given us an incredible new Catching Fire poster that’s very different from any we’ve seen yet from either film! Be sure to click for full size! Not only are we getting a new poster, but news of an awesome new official contest for all Hunger Games fans! Today’s poster of Katniss Everdeen includes a tagline pulled straight from the incredible words of Suzanne Collins – The sun persists on rising, so I make myself stand. What do you think of the poster? I love how the clouds become wings! Are you going to enter the Catching Fire illustration contest? If you do, we’d love if you could share your entries with us too – we always love to see your creative fan art! If you liked all of the movie tie-ins for The Hunger Games, you’ll be happy to know that Amazon now has Catching Fire: The Official Illustrated Movie Companion available for pre-order. 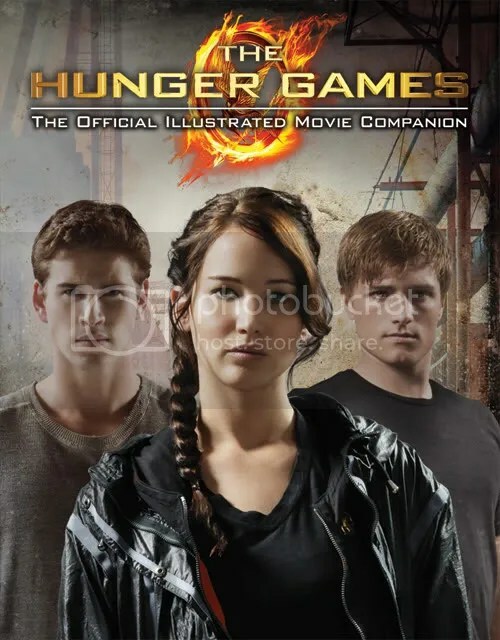 No cover photo has been released, but the book’s description mimics that of the official movie companion to The Hunger Games, and both books share the same author. Catching Fire, the New York Times bestseller by Suzanne Collins, is now a major motion picture — and this is your guide to all of the movie’s excitement, both in front of the camera and behind it. Go behind the scenes of the making of Catching Fire with exclusive materials, including back-stage photos and interviews. From the screenwriting process to the casting decisions, from the fantastic new sets and gorgeous costumes to the actors’ performances and the director’s vision, this is the definitive companion to the second Hunger Games film. The listed release date is November 22, 2013, the same date Catching Fire arrives in theaters. To pre-order your copy, head over to Amazon. Will you be pre-ordering this companion? Would you like to see other tie-ins, like those released for The Hunger Games? Here’s the music from the official The Hunger Games: Catching Fire teaser trailer: “Beyond Fire” by T.T.L. There’s going to be a Lionsgate presentation at this year’s CinemaCon event in Las Vegas for The Hunger Games: Catching Fire. The conference is all about debuting upcoming films and products – taking along some of the big stars, producers and directors to talk to cinema onwers and operators from around the world. Lionsgate will be giving its presentation on Thursday April 18 with word that Sam Claflin, who plays Finnick Odair, will be there. Collider has been down at the venue and spied this really huge display for Catching Fire. As you can see, Lionsgate has placed huge versions of the Character osters next to one another in a massive display. They’re also reporting that Lionsgate will be showing new footage of the film at CinemaCon. We will be sure to keep you updated. You can check out the rest of the pics here. It’s finally here – The Hunger Games: Catching Fire trailer. Liam Hemsworth, who plays Gale Hawthorne, took to the stage at the 2013 MTV Movie Awards to introduce two and half minutes of the first ever seen footage of Catching Fire. What did you think? Give us your reaction in the comments below. The fourth photo (of five) from The Hunger Games: Catching Fire thanks to the #HungerGamesExplorer Twitter campaign is of President Snow and Plutarch Heavensbee, the Head GameMaker. There’s just one more Catching Fire still to be revealed, so make sure you jump on Twitter and use the #HungerGamesExplorer tag to help unlock the last image on the Hunger Games Explorer site.